Heading west from Cedar Rapids this morning I kept seeing a bird sitting on the poles alongside the road and flying over the cornfields. I have now identified it as a red-winged blackbird. 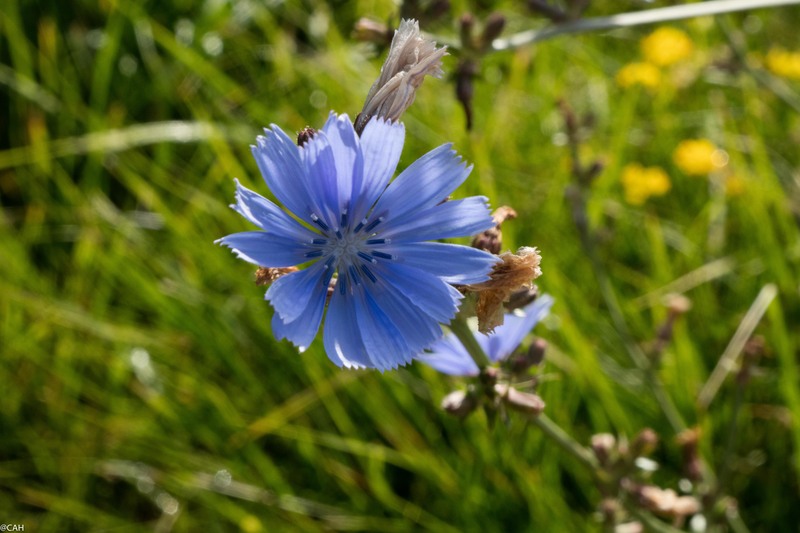 This blue flower grows on the roadside here but I have yet to identify it and all the other flowers seen so far. I am slowly finding websites that can help with the flowers and have the Audubon Bird app on my phone which saves me lugging bird books around. Much of the old Lincoln Highway in Iowa is a gravel road so we created a fair bit of dust as we drove along them. We even passed a couple of wineries which I did not expect to find here but it was too early in the day and they were closed. Near Colo, we saw the first sheep and goats in the state (cows being the only farm animal seen so far) and also more deer. 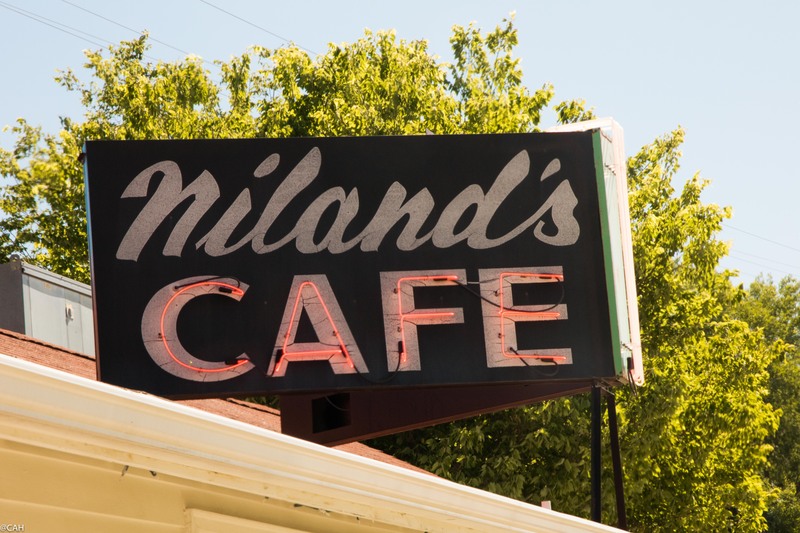 We stopped for coffee at Niland’s community-run café which sits at the intersection of Routes 30 & 65; the Lincoln Highway and the Jefferson Highway. I had never heard of the latter ‘From Pine to Palm’ route which runs from Winnipeg to New Orleans. Something to explore perhaps? The old gas station has been restored and is now a museum but the motel is up and running again. 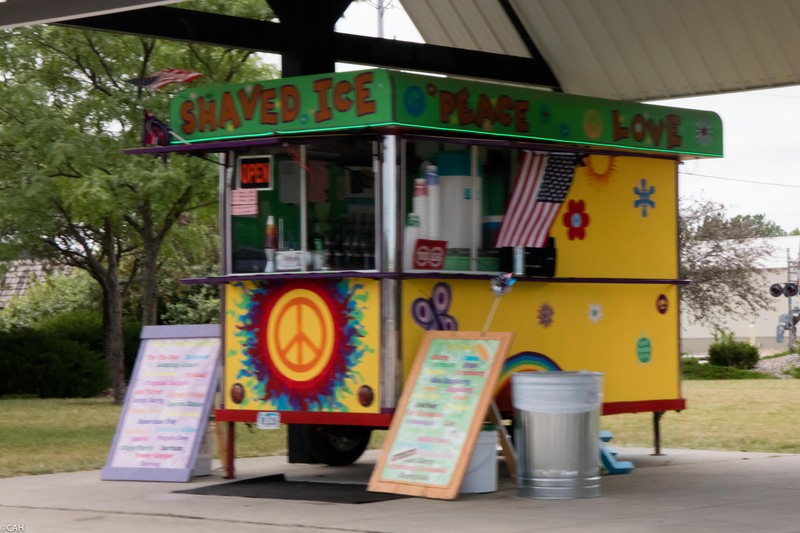 Further on, lunch was in a small park in Carroll where this stall was selling shaved ices. He was not doing great business as the temperature stayed stubbornly in the low 70s with a fair amount of cloud cover. He was a Jimi Hendrix fan we assume, as he had a large poster of him on the back of the stall door. Other musical snippets from today are: 1. I read somewhere that Antonin Dvorák stayed in Iowa with his family in the summer of 1893 and wrote the ‘New World Symphony’ while here and 2: at one point we were passed by a car in which the passenger (who looked as if he should be auditioning for ZZ Top) sat combing his beard. Today we crossed the Missouri-Mississippi Divide and then crossed the Missouri just before entering Omaha and Nebraska. Iowa has the section which is the most northerly of the entire Lincoln Highway. The best sign of today was one for ‘Woodbine Optimists’ Club’. This was intriguing and after a bit of digging around I have discovered that they are a community organisation who do youth work. R30 continues past Omaha but as the highway goes through Omaha and passed through the very street we are staying on, we are staying here for a night. The downtown area around the old market has lots of interesting shops, restaurants and bars. There is a fantastic secondhand bookshop: Jackson Street Books which was even open on a holiday Sunday evening. We had dinner at the Louisiana Kitchen which has live jazz but on Saturday not Sunday sadly. Tomorrow we head further into Nebraska.